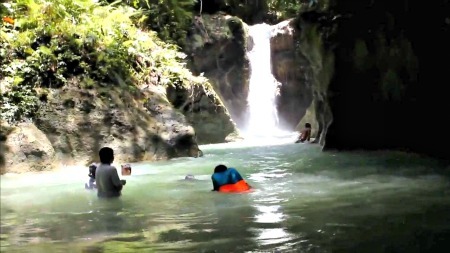 Clarin municipal planning officer Pedrito Tupas said the town has seven coastal and 17 upland and lowland barangays that are naturally blessed with waterfalls, springs and unmolested caves. Clarin is in the northeastern part of Bohol and is 61 kilometers from Tagbilaran City. Tupas boasts that the town has three uninhabited islets that are perfect for theme parks and island resort development and fish holes attractive to scuba diving enthusiasts. The islets are highly rated marine protected area that has been listed in the global network of marine parks, added Tupas. Already identified potential sites for tourism enterprise development are Clarin Heights, Binaliw Falls, Tangub Spring, Bogtongbod Cave, Majigpit islet and marine sanctuary; Mangrove Boardwalks, coastal community life tours and village immersions; island hopping and water sports activities. Clarin Heights has an idyllic charm. It offers Bohol foods and sweets, souvenir shops, health and wellness centers, and cultural performers. Binaliw Falls is located just a little more than a kilometer away from the barangay proper, 5 km away from Clarin Wharf, and 14 km from Tubigon Wharf. It is the place to go for people who want a dash of adventure while experiencing the beauty of nature. The Falls provides a relaxing experience as it is surrounded by thick, lush forests and gorgeous limestone gorges. It has interesting rock formations and age-old trees with hanging roots. Another experience is the Tangub Spring that is located at the foot of Clarin Heights. It home to a tribe of macaque monkeys. Tangub Spring offers cool, fresh waters of the natural pool. Bogtongbod cave offers an array of marvelous beauty of the subterranean world with its stalactites, stalagmites, columns, drapes, flowstones, candle, eerie and grotesque formations as well as the mystical six (6) natural pools. Another ‘must experience’ tour in Clarin is the Majigpit Islet and fish sanctuary located within the outer ends of the Danajon Double Barrier Reef, better known as the “Islet of Gentle Touch,” for its abundance of sea urchins. This uninhabited islet is one of the three isles drifting sand bars and shallow reefs as seen from the Clarin wharf. The islet offers a wide array of soft and hard corals, sea grasses, tide flats and a huge variety of tropical fish population. The Clarin Mangrove Boardwalk is another easy tourist access to the mangrove environment. It is just a few meters from the Clarin town hall. The Bohol Island State University in Clarin manages the Mangrove Boardwalk. Said to be the biggest sea creature banks offering the perfect environment for spawning, juvenile fish sanctuary and the haven for the famed seashells, this mangrove environment carries a wide variety of 26 species of true mangroves common in the island. Future development plans include a recreational fishing area, restaurant, function rooms, kayaking, snorkeling and diving tours to Majigpit Islet and Fish Sanctuary.